Malinowski’s impressions bring to light the sincerity and care with which the people of eastern Libya are taking their first steps in building a legitimate democracy from scratch. He stresses, however, the delicacy and uncertainty of this process and the importance of foreign scrutiny as the country moves forward. 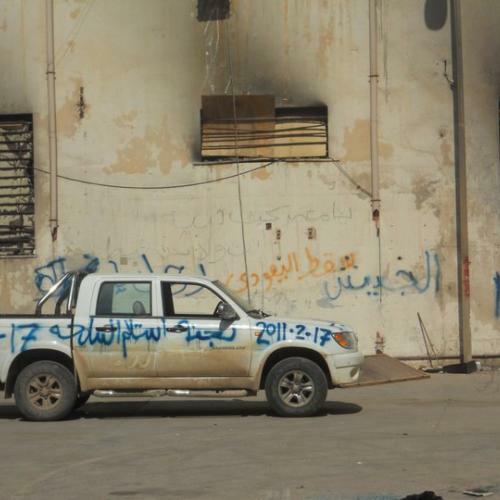 This slideshow features photographs taken by HRW researcher Sidney Kwiram, who accompanied Malinowski on his visit to the rebel-controlled city of Benghazi. Some question whether the tribes will cause Libya to fragment once the fighting stops, but others claim national unity is now a more powerful force than tribalism. Tobruk, March 2011. 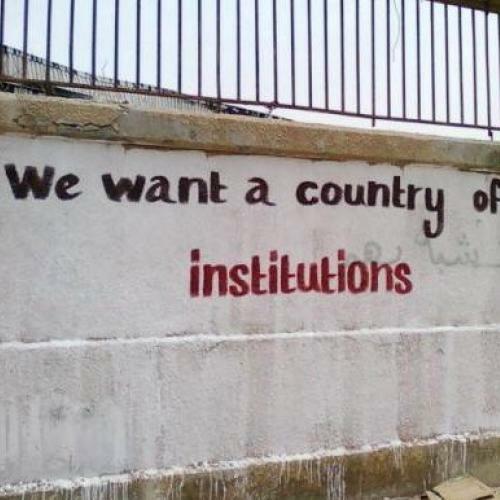 On the walls in rebel-controlled areas, some residents exercise their new freedom of speech through graffiti. 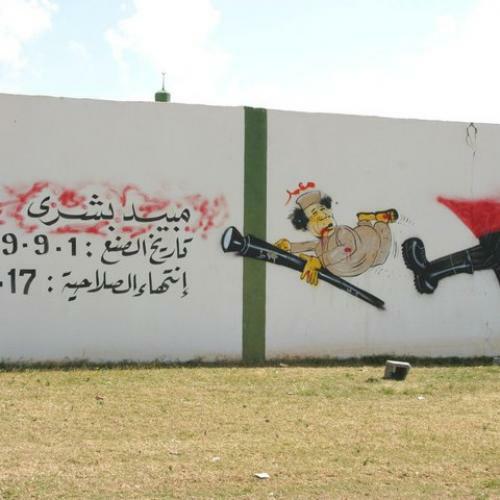 The date February 17 is synonymous with the revolution, even though it actually began two days earlier: in Benghazi on February 15 and in Baida on February 16. 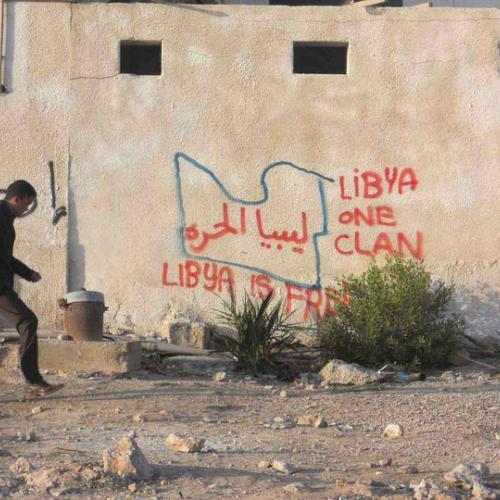 Behind the courthouse in Benghazi, March 2011. 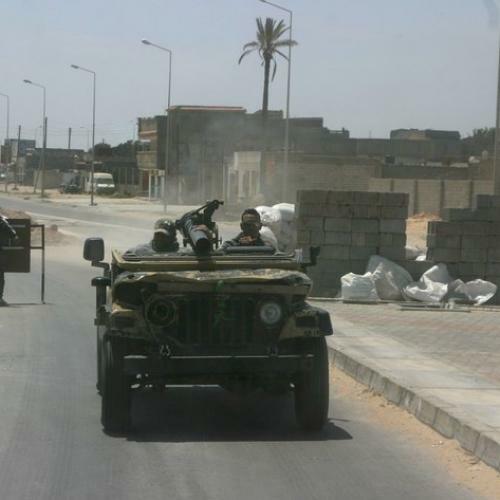 Benghazi fell to the rebels on February 20 when they overran the main military barracks. Graffiti on one of the outer walls that is still standing. 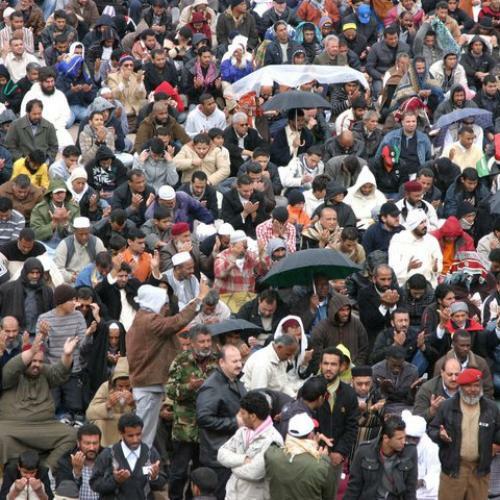 Benghazi, March 2011. 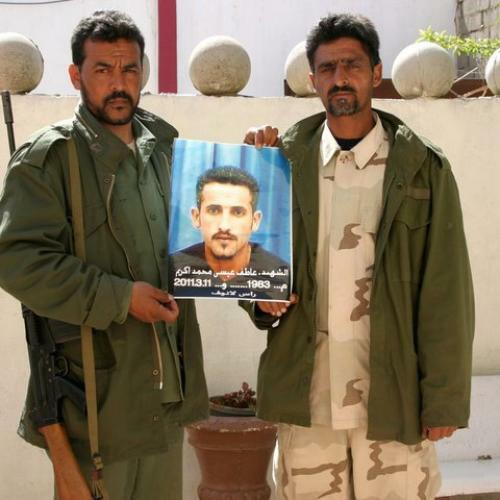 Two rebel fighters patrolling the eastern town of Baida hold a picture of Atif Issa El-Kraim, who died in the fighting on March 11. Baida, March 2011. 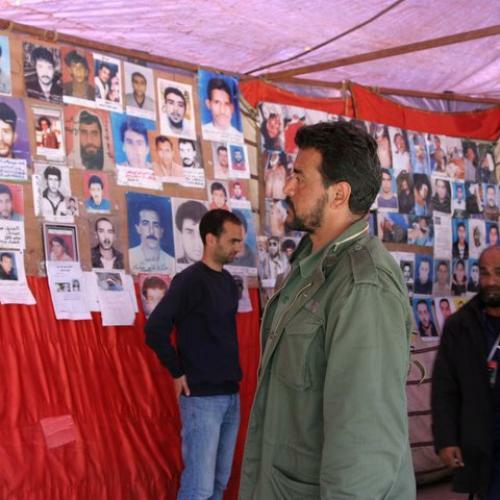 In rebel-controlled areas, the pictures of the dead and missing appear on hospital walls, courthouses and checkpoints. Some of the missing are confirmed to be detained by Qaddafi forces. These images are in the makeshift headquarters for the volunteers who took control of Baida in February. Baida, March, 2011. 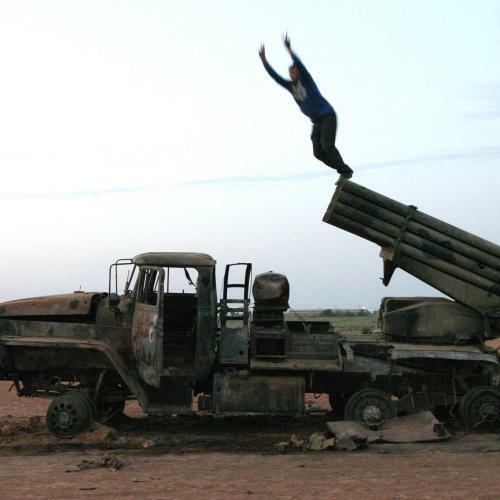 Rebel forces inherited abandoned stockpiles of weapons and machinery that Qaddafi forces left behind. After repairing them, they are sent to the frontlines. Between Benghazi to Ajdabiya, April 2011. Friday prayers are the time that the people of Benghazi gather at the courthouse where the revolution began, using their new freedom of assembly. Benghazi, April 2011. 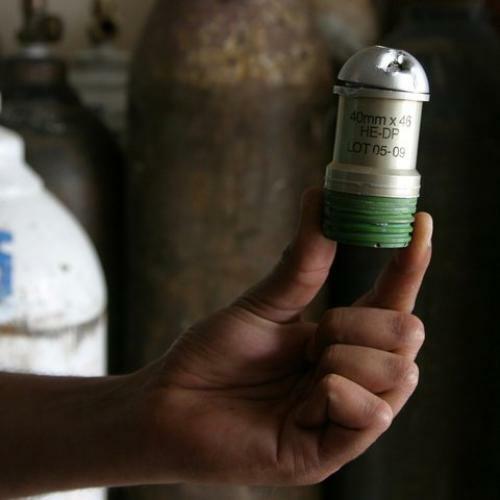 Grenades, shrapnel and spent munition are collected in Misrata, despite the dangers of unexploded ordnance. Misrata, April 2011. 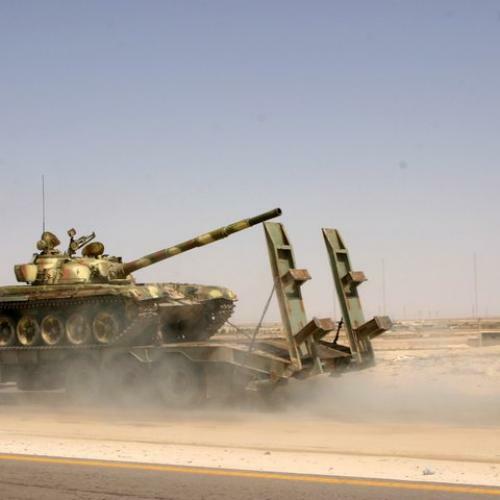 While they were under siege, the rebel forces in Misrata organized obstacles and checkpoints in the streets to block the advance of Qaddafi’s tanks. Misrata, April 2011. 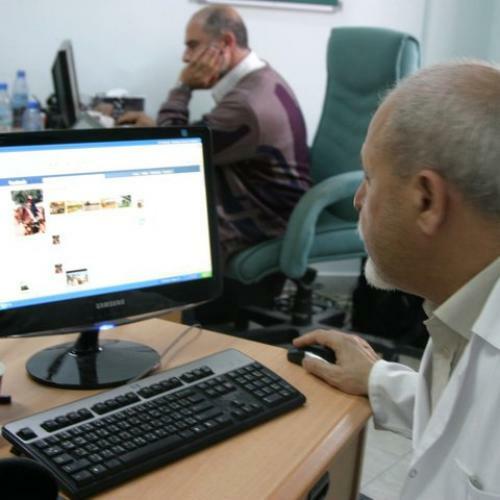 The phone lines were cut in Misrata, and internet was down. At a hospital in the city, they had two-way satellite internet. They used it to communicate to the world what was happening during the siege. Misrata, April 2011. More than 6,000 migrant workers fled the fighting in Misrata but got stuck at a displacement camp near the port, unable to leave for two months, until aid organizations evacuated them. Kafani Muhammad Adam was returning to Chad. 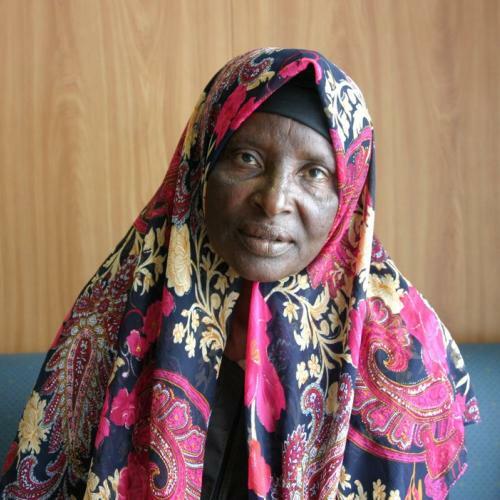 Her husband went missing in the beginning of March outside Misrata. Misrata, April 2011. The citizens of Benghazi now come to pose and play on the burnt out remnants of Qaddafi’s machinery, which was poised to besiege the city before being bombed by NATO in the early morning hours of March 19. On the road leading from Ajdabiya to Benghazi, April 2011. Qaddafi eviscerated Libya’s institutions, building a state with no constitution and little formal structure, on the theory that nothing need come between the People and their Leader. 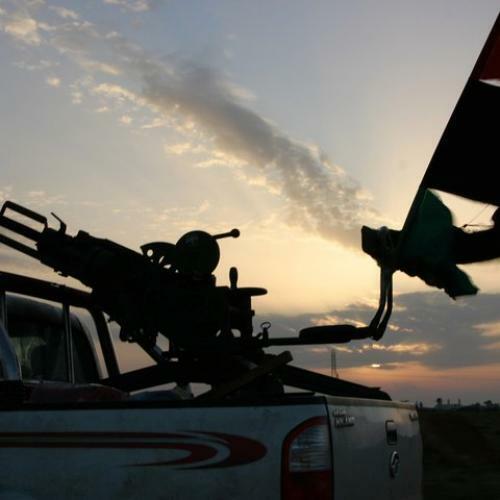 Libya’s rebels emphasize that they want the opposite. Derna, April 26. Click here for a 1978 editorial from The New Republic on the U.S. role in supporting the Qaddafi regime. 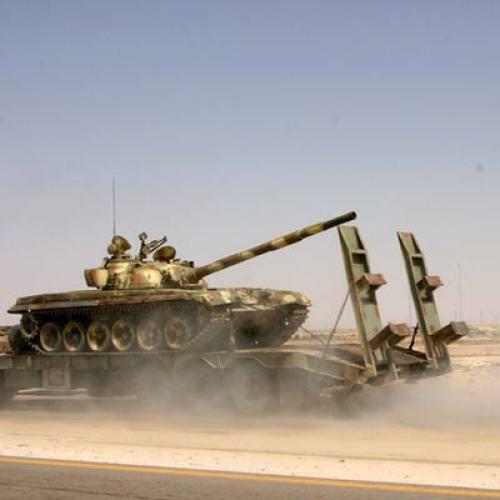 Click here to learn why the Libyan rebels desperately need better training. Click here to read Josef Joffe on Obama’s foreign policy.